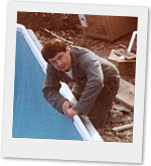 In 1968 Bob Simpson started servicing pools and never looked back. With his attention to customer service and selling only quality products, the reputation of The Pool Shoppe both from the service and retail standpoint, have allowed our company to grow and succeed. This, however, could have only been accomplished with the dedication and support of many long-time, professional employees, with their passion for providing outstanding customer service and their consistent attention to detail. Each segment of our company, retail, service and construction, is always looking to grow our Family. The pride in workmanship shows through each and every finished project. If this is the satisfaction you look for in your job, please contact us or apply online for seasonal/summer employment. As a Full/Flex Time Sales Team member, your top priority is customer satisfaction. You are passionate about our brand, our culture and our dedication to customer care. Referrals are one of your greatest compliments! You are energetic, friendly and courteous. You can multi-task and communicate effectively with your fellow team members and you are aware of our customer’s valued time and handle transactions in an organized and professional manner. As a team member, your top priority is customer satisfaction. You will be responsible to work both independently and in a team environment reflecting our company’s professionalism and awareness of inventory control. You will perform warehousing functions involving the receiving, processing, and stocking of inventory and supplies as well as delivering and assisting with the installation of products at a customer’s home. You are self motivated, follow instructions extremely well and have excellent written and oral communication skills. You must be able to lift up to 50lbs and possess a minimum G2 drivers license. As a team member, your top priority is customer satisfaction. You will handle the parts requirements of customers through counter service and sales and maintain a clean and well stocked parts display area. You must be able to lift up to 50lbs. You will assist the store, service and warehouse departments in performing labouring duties involving product assembly, cleaning, stocking and warehouse organization. As a team member, your top priority is customer satisfaction. You are the first person that our customers will meet when they enter our store and you will have the opportunity to meet their needs through product education or water analysis. You are energetic, friendly and courteous with a passion for customer service. You can multi-task and communicate effectively with your fellow team members. You are aware of our customer’s valued time and handle transactions in a quick and professional manner. As a team member, your top priority is customer satisfaction. You will safely and efficiently maintain our liquid chlorine dispensing station as well as dispense liquid chlorine for purchase by customers. You will create a warm, friendly and aesthetically appealing outdoor and indoor environment for our customers including maintenance of our pool court display pools and grounds. You will assist customers with their purchases by carrying large items to their vehicles and must have sufficient strength to lift and carry up to 50 lbs. You will assist the store, service and warehouse departments in performing labouring duties involving product assembly, cleaning, stocking and warehouse organization. As a Part Time Sales Team member, your top priority is customer satisfaction. You are passionate about our brand, our culture and our dedication to customer care. Referrals are one of your greatest compliments! You are energetic, friendly and courteous. You can multi-task and communicate effectively with your fellow team members and you are aware of our customer’s valued time and handle transactions in an organized and professional manner. As a team member, your top priority is customer satisfaction. You will be responsible to work both independently and in a team environment reflecting our company’s professionalism as well as understand the seasonality of our business. With extensive training, you will visit our customer’s homes weekly providing necessary maintenance to the pool filtration equipment. You will follow procedures on how to skim the water surface, vacuum the pool and test and adjust the water chemistry as necessary. You possess a valid driver’s licence. As a team member, your top priority is customer satisfaction. You will be responsible to work in a team environment reflecting our company’s professionalism as well as understand the seasonality of our business. You will work alongside our liner technicians and perform the necessary stages required in preparation of a new pool liner. You will assist with the draining and removing of the exiting liner, preparing the pool surfaces and installing the new coping and liner. Assist with installation of Safety Covers. You are self-motivated, follow instructions extremely well and possess a driver’s license with a clean driver’s abstract. As a team member, your top priority is customer satisfaction. You will be responsible to work both independently and in a team environment reflective our company’s professionalism as well as understand the seasonality of our business. We are always interested to review our programs with experienced applicants currently working in the Industry. As well, we will consider service-minded applicants with different \field experiences to join us in our exciting and fun Industry. We service both swimming pool and spa equipment and always look to continually train and upgrade our Service Technicians to keep current with the Industry trends. Applicants for this position must possess a driver’s license with a clean driver’s abstract. As a team member, your top priority is customer satisfaction. You will be responsible to work in a team environment reflecting our company’s professionalism as well as understand the seasonality of our business. Our service department is seeking people to work starting April and working until the end of August OR to the end of our season in November. You may work in many areas of our service department at any given time. This will include pool openings or closings, above-ground pool construction, in-ground pool renovations, assisting with liner and safety cover installations or other duties as may be assigned. You are self-motivated, follow instructions extremely well and possess a driver’s license with a clean driver’s abstract. Your Content Goes HereAs a team member, your top priority is customer satisfaction. You will receive incoming calls and enquiries to our Service Department as well as qualify the caller’s service needs. You will work with our operating system to schedule and create an accurate work order for the crews you dispatch, data input service notes after the service is done and complete the payment process. You must be comfortable to converse with our Valued Service Customers with a pleasant disposition in a professional manner either on the telephone or in person. With training, you will learn to ask the probing questions and offer trouble-shooting advice to receive the information required to complete an accurate work order. Your responsibilities will include using a discharge pump to lower the water level and vacuum the pool, pumping water and debris from winter covers, and removing the accessories such as pool ladders, lights and handrails. You may be moved in to other areas within the Service Group as the season progresses. This could include in the liner and construction segment or our business. You would work with a Senior Technician to perform the steps necessary to winterize and close pools in the Fall Season. A valid G or G2 driver’s license and clean driving record is preferred; applicants can review their situation on a need-be basis. The Pool Shoppe is a family owned and operated business based in Hamilton since 1968. We are seeking an experienced pool service technician to join our growing team. The ideal candidate will provide the highest level of customer service and report to the service managers. OR apply through our website employment section (other positions may be available). The Pool Shoppe is a family owned and operated business based in Hamilton since 1968. We are seeking an experienced swimming pool liner installer to join our growing team. The ideal candidate will provide the highest level of customer service and professionalism and report to the service managers. The Pool Shoppe is a family owned and operated business based in Hamilton since 1968. We are seeking energetic, hardworking individuals to join our growing construction team. The ideal candidate/s will report to the construction manager.